Mobile ad spend is on the rise in the financial marketing field, with growth of 314 percent from 2010 to 2011. This was the result of a comScore study of Millennial Media’s global platform observations across its thousands of mobile ad campaigns reaching over 300 million unique global mobile users. The financial vertical consists of banks, credit cards, stock trading, electronic payments and insurance services. Such phenomenal growth has exalted the segment to become the leading global brand advertising vertical on the mobile advertising company’s platform. Clickz.com reported on the details of the data. 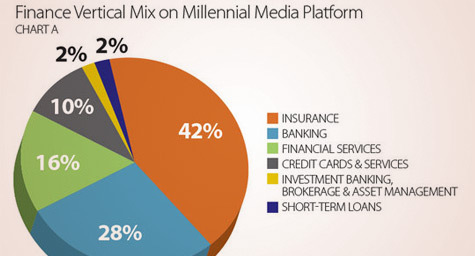 According to the study, the insurance segment accounted for 42 percent of financial mobile ad share, followed by 28 percent by banking, 16 percent by financial services, 10 percent by credit cards, and a mere 2 percent by both investment banking and short-term loans. Mobile ad campaigns were mainly used by insurance companies to provide consumers access to immediate quotes, while the banking industry viewed mobile ads as a way to generate leads and registrations. The financial industry’s rationale for increasing their mobile ad spend was attributed to the desirable demographics of those who engage with mobile financial content. The majority of this audience is affluent, male, and between the ages of 18 and 34, with almost half earning $75,000 or more. In addition, they exhibit long-term brand loyalty are willing to spend more for brands they like and trust. These qualities create major opportunities for financial brands to start developing lifelong relationships with consumers ideal for their services. The study also showed that more than 90 percent of these mobile ad campaigns used particular device types to target mobile finance consumers since this audience was more likely to use tablets and e-readers than the overall mobile audience. In fact, the iPad 2 was used by a whopping 12 percent of respondents. Finally, the results revealed that the leading audience-targeting methods used in last year’s mobile finance campaigns were content targeting, tactical targeting, local targeting, and demographic targeting. Interestingly, the best strategy was to think beyond the financial realm for content creation and ad placement. Most mobile ad campaigns were featured on sites about sports, news, and games. “That is where brand advertisers are running campaigns,” said Marcus Startzel, general manager of North America, Millennial Media. “Mobile finance users are everywhere. To discover how to use mobile ads to grow your financial brand, contact MDG Advertising today at 561-338-7797 or visit mdgadvertising.com. MDG Advertising, a full-service Florida advertising firm with offices in Boca Raton and New York, NY, specializes in developing targeted Internet marketing solutions, exceptional creative executions and solid branding and media buying strategies that give financial clients a competitive advantage. Our core capabilities include branding, logo design, creative, digital marketing, mobile advertising, print advertising, direct mail marketing, media planning and buying, TV and radio, public relations, Web design and development, email marketing, social media marketing, and SEO.